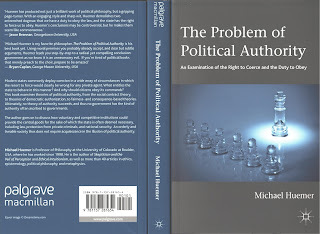 I’ve been meaning to recommend Michael Huemer’s latest book — The Problem of Political Authority — for some time. I don't have much to say about it, except that it is the most comprehensive and tightly-argued defence of political anarchism that I’ve ever come across.It is a book of two halves. In the first half, Huemer looks at the problem of political authority, which he says consists in two sub-problems. The first being the problem of political legitimacy, i.e. does the state have to make certain laws and enforce them by coercion? The second being the problem of political obligation, i.e. do people have an obligation to follow the laws made by the state? Huemer uses an arresting thought experiment to start his investigation of both questions. He asks us to imagine a village with a vandalism problem (and no state to police it). You and your family decide to put a stop to the problem by patrolling the neighbourhood with your guns, catching vandals, and locking them in your basement. You keep them locked in your basement for a few years to teach them a lesson. You then go around to all your neighbours and ask them for money to fund your patrol. If they don’t pay, you drag them back to your house and lock them in the basement as well. The question is: are your actions here reasonable? Do you have the authority to do this? And do your neighbours have an obligation to obey your rule? Huemer presumes that most people would find your actions morally outrageous. But this brings the problem of political authority into sharp relief. If your actions are not morally justified, and if no one has an obligation to obey you, then what exactly is it that gives the state the authority to do the same things? Huemer proceeds through the leading answers to that question in the first part of the book, finding serious shortcomings in all of them. What I like about this part of the book — and about the book as whole — is the simple, matter-of-fact way in which Huemer presents his arguments. Take, for example, his discussion of social contract theories of political authority. Now, I’m broadly sympathetic to these theories, and I think they offer the best route to a plausible metaethics, but I’m impressed at how efficiently Huemer exposes their deficiencies. He relentlessly points out the ahistorical, anti-empirical, impractical and idealising assumptions at the heart of the these theories. There’s nothing new in this (I’ve heard these criticisms before) but something about Huemer’s prose style makes it less easy to ignore them then it had been in the past. The second half of the book argues for a form “anarcho-capitalism”. This part is more constructive and, perhaps unsurprisingly, less persuasive (to me, at any rate). The problem is that Huemer argues for a pretty radical set of views, calling for the privatisation of social security (and the “protection” industries as a whole), the law, and the military. I have a good deal of resistance, both intellectual and intuitive, to these views and I have a hard time overcoming that resistance. To be fair, Huemer seems perfectly aware that his views are radical; he simply asks the reader not to dismiss them for that reason alone. He has his arguments, and if one is going to reject his views, the premises of those arguments will need careful scrutiny. This short review, however, is not the place for that. In sum, an impressive, easy to read, and efficient critique of political authority, coupled with a provocative defence of anarcho-capitalism. Worth a read.